(Nanowerk Spotlight) Hair formulations, especially hair color products, are based on alkalis or oxidation, which as many have noticed, leaves your hair thinner and dry after treatments. Hair color products are formulated in many ways with different ingredients and permanent hair dyes consist of color precursors, which are oxidized on the hair surface by hydrogen peroxide; and these redox reactions can be damaging to hair. Nanotechnology researchers now have developed a natural and non-damaging hair surface engineering technique for making hair coloring formulations that do not use any chemical reactions but instead relies only on physical forces acting at a very close range. They have published their findings in Nanoscale ("Self-assembly of clay nanotubes on hair surface for medical and cosmetic formulations"). Hair surface engineering can color grey damaged hair (below) to orange (above) in under 5 minutes using a completely natural formulation. "We use a nanometric tubule clay powder, add it to a water-based dye/drug solution and simply wash hair with it, coating the surface with a thin layer of the microtubes," explains Abhishek Panchal, a PhD Student in Micro and Nanosystems Engineering at Lousiana Tech University and first author of the paper. "The coating, which colors the hair, is not noticeable via sight or touch but is only visible under the microscope." The new technique works in a ubiquitous fashion and without the need for any special solvents or harmful alkali additives typical for hair products. 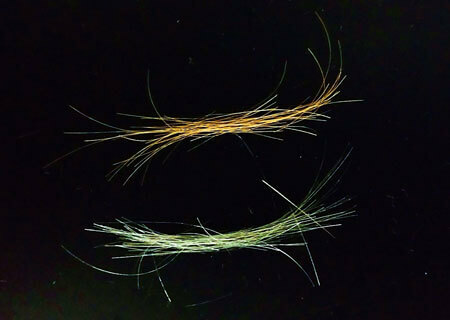 By following the process laid out in the Nanoscale paper it becomes possible to prepare a hair formulation with natural colors without a single synthetic compound. At the core of this process is self-assembly of halloysite clay nanotubes, a natural biocompatible clay material with 50-60 nm external and 10-15 nm inner diameters and length within 0.5-1.5 µm. The team prepared clay nanotubes with an enlarged cavity, giving them a loading capacity of 35 wt.%. Under suitable conditions, dye-loaded clay nanotubes arrange themselves in a set pattern on the hair surface during hair drying via physical adsorption. 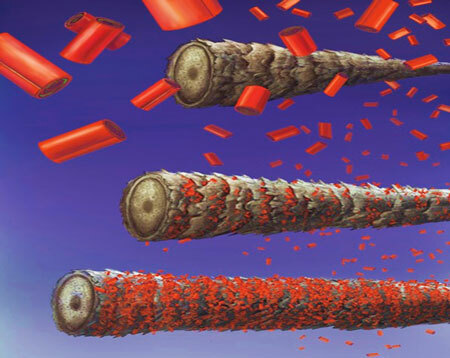 Illustration for self-assembly of clay nanotubes on hair surface beneath the cuticles. This novel technique allows the encapsulation and use of water-insoluble dyes, which previously have not been suitable for hair care. "The most obvious use of our findings is the improvement of cosmetic and medical hair care formulations by using eco-friendly, harmless aqueous clay colloids with hair dyes," notes Prof. Yuri Lvov, who together with Prof. Rawil Fakhruillin from Kazan Federal University, led this work. "We demonstrated that it is possible with our technique to color even grey and damaged hair in under 5 minutes." Medical treatments, like anti-lice and hair loss prevention, are some of the therapeutic applications of this hair surface engineering technique. In in vivo studies, the team demonstrated a highly effective anti-lice formulation using the halloysite clay nanotubes. The bare surface of hair (left) is enveloped by a layer of clay after simple coating process (right). The detailed images have been captured by a Scanning Electron Microscope (SEM). "The same surface engineering approach is applicable to textile microfiber modifications because natural textiles like like wool, silk, cellulose, but also biomimetic synthetic textiles, have similar chemical composition," says Panchal. "This makes it possible to modify textile fibers with regard to coloring, flame retardancy and many other attributes. Consider that we can modify our tubes to deliver a wide range of molecules including enzymes, antibiotics, polymers and perfumes. Water-insoluble compounds can also be encapsulated into the tubes and then be used as safe aqueous clay colloids." The researchers are looking for collaboration opportunities with companies to turn their proprietary technique into commercial hair care formulations.